iOS navigation has matured to the point where it doesn’t matter where our apps are hiding anymore—with a swipe and a few taps we can navigate through the deepest of folders in just a few seconds. Power users can manipulate iOS to do their bidding: We can launch apps, make calls, and send messages without needing to jump through a single home screen hoop, thanks to a little help from the Notification Center, Siri, and even Spotlight. Launcher apps take this concept to another level. Where Apple’s solutions add up to little more than secret passages and hidden shortcuts, launchers provide a centralized place where we can manage and organize our favorite apps and everyday tasks into a single, contained system. While they’re not quite as powerful or convenient as the ones on our Macs (mostly due to the lack of keyboard shortcuts), launchers on iPhone are little gems of efficiency, condensing series of actions and complex taps into literal easy buttons, and saving our fingers from their routine daily calisthenics. For example, I can use iOS to devise a pretty easy way to call my wife—set her up as a favorite contact, enter the multitasking carousel, find her name at the top, tap, and select the phone icon—but with a launcher app I can boil that whole process down to a single tap. However, not all launchers are created equal. While I can recreate the rudimentary task described above in any of them, the ease and speed of use can vary greatly. There’s a perception that launchers are geared more toward professional users, but with a thoughtful user interface that needn’t be the case: The best ones balance power and simplicity in a package that promotes productivity and encourages exploration. Bundled actions are a must, of course, but URL Scheme and callback support are equally important for more advanced users. Above all, launchers need to make our lives easier. It’s not just about cutting down on taps—it’s about creating an experience that operates on a faster and more efficient plane than the one Apple has created. Here’s our list of favorites—or rather, favorite. If not for Launch Center Pro ($5), the idea of the iOS launcher would probably still be in the planning stages. Contrast might not have been the first developer to make one, but it was certainly the first to get it right, and nearly three years after its debut, Launch Center Pro is still the one to beat. And it might be another three years before anything comes close. 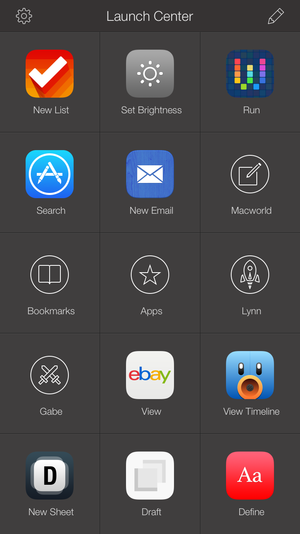 Behind the scenes of Launch Center Pro’s simple interface lies a powerful system of shortcuts. For a powerful productivity app, Launch Center Pro’s simplicity is stunning. The interface consists of 15 squares inside which you can place groups or actions. 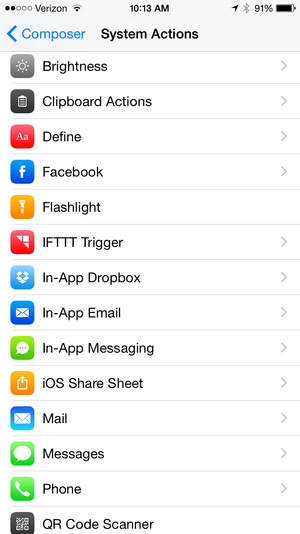 Tapping one of the spaces launches the specific action, whether that involves something that can be accomplished without leaving (like turning on the flashlight or adjusting the screen brightness) or jettisoning off to one of its many supported apps. You won’t find any traditional folders within Launch Center Pro, but long-tapping on one of the customizable group icons brings up a new screen of squares that lets you slide your finger to trigger one of the related actions. It’s a clever use of multi-touch and a good example of just how much attention Contrast has given to detail. But what truly sets Launch Center Pro apart from the field is its third-party app support. An exhaustive catalogue of apps are available in its Action Composer, including a tab that neatly delineates the ones installed on your device, and many of them have bundled actions to make things even easier. The ones without action rely on a knowledge of URL Schemes and input tags, which have a bit of a learning curve, but even if you stick with the ones that are included, there’s plenty Launch Center Pro can do. In addition to shedding the tedium from tasks like searching through a mountain of contacts or capturing thoughts before they escape, the app also integrates with the popular IFTT to trigger recipes for things that go beyond the scope of your iPhone, like turning on Hue lights or adjusting your Nest thermometer. Furthermore, actions can be scheduled to launch at determined times or locations, and you can automate posts, tweets, and uploads for whatever your favorite service may be. It’s true what they say: Actions do speak louder than words. But even if you don’t take advantage of its advanced features, Launch Center Pro still offers a bountiful array of shortcuts to simplify life on your iPhone. Even if you’ve become a wizard at navigating your home screens by touch, Launch Center Pro can still enhance your iOS experience in wonderful ways. It’s so good in fact, I had a hard time finding anything that rivaled its power and versatility. The app’s friendly interface makes it so the learning curve is only as steep as you want it to be. If you’re looking for an easy way to access your favorite apps without messing with your home screen layout, it can do that, but even beyond its most basic function, Launch Center Pro doesn’t necessarily require an understanding of how it works. Power users can dig as deep as they want, but the “Pro” surname need not scare away novices. So for this roundup, there won’t be a runner-up. Rather, I have collected a series of apps that either argument Launch Center Pro or fill the small voids it leaves. If you want a complete shortcut solution for your iPhone, Launch Center Pro isn’t just my top recommendation for an everything launcher, it’s my only one. The workflows you create are like little easy buttons for the tedious things in your life. When I started this roundup, I assumed my winner and runner-up would be Launch Center Pro and Workflow ($3), but as I delved deeper into what they do, I realized something: They’re not competitors, they’re companions. And to say that Workflow is a runner-up to Launch Center Pro is to do both apps a disservice. It’s not even really fair to call Workflow a launcher. Where Launch Center Pro is at its heart an environment for simple shortcuts like opening apps and searching Spotify or Google Images, Workflow is a desktop-caliber automation tool. Instead of keystrokes common with its OS X counterparts, it uses a simple interface of color-coded rectangles that helps you quickly get in and out of your actions. But while you can use it to launch apps if you must, it’s far better served for condensing a complex series of steps into a single button. Some of the sample workflows offered within the app are Pizza Assistant (which dials your favorite pizza and schedules a reminder to pick it up) and Time Machine (for viewing photos you snapped a year ago), but its clever drag-and-drop interface makes it easy to test all sorts of action combinations until you find the right mix. 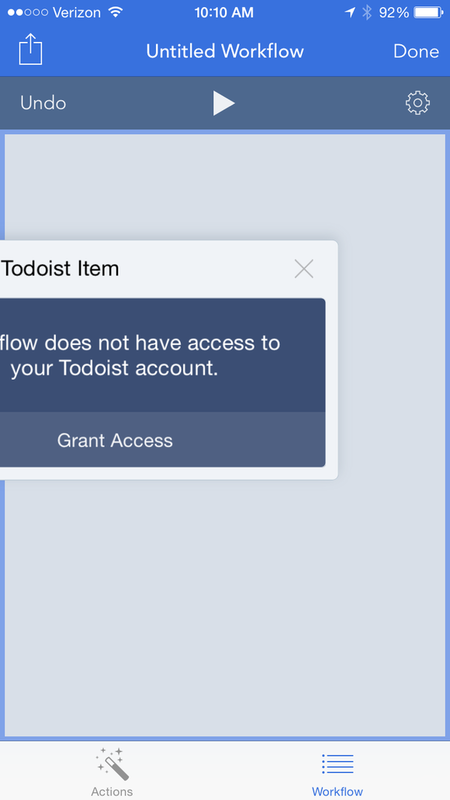 Workflow is like a little taste of OS X’s Automator on your iPhone, right down to its drag-and-drop interface. 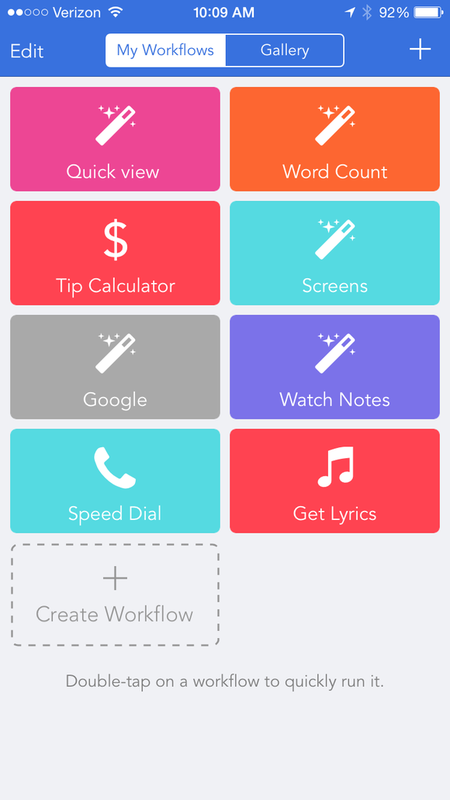 It’s not so much that Workflow can do things Launch Center Pro can’t, it’s that they work incredibly well together, so much so that one of the options in Workflow’s action composer is adding it to a free spot on your Launch Center Pro home screen. And with an excellent use of iOS 8’s extensions, you rarely even have to open the app on its own unless you want to create a new action or workflow. Like Launch Center Pro, a deep knowledge of URL schemes will help unlock Workflow’s tremendous power, but the app does a remarkable job keeping things as simple as possible, offering a tremendous library of stackable actions that lets the most amateur of automators set up multi-step workflows for a wide variety of apps. And if the lengthy list of actions is over your head, Workflow offers a great gallery of pre-made processes that will transform your iPhone without needing to lift a finger. Well, at least not more than one. 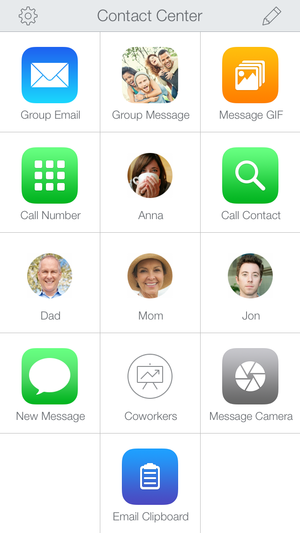 Somehow, Contact Center makes messaging people on our iPhones even easier. Launch Center Pro does plenty of things to make it easy to call, text, and message our friends and loved ones, but those who have a lot of people to interact with each day will be better served by checking out Contrast’s other launcher app. Contact Center (free) looks and acts so much like Launch Center Pro, I’m surprised the two apps haven’t been merged by now. It would be easy to add a dedicated screen just for contacts, but keeping it separate does have its charms, freeing up space for extra workflows in the main app and allowing for super-fast messaging in the other. You don’t find a mountain of actions like in Launch Center Pro, but everything you need to stay in touch can be found inside: You can set actions for sending group messages and mass emails at a tap, or tap into the Photos app to quickly share and attach pictures. And my personal favorite: It even links up with Giphy so you can find hilarious gifs to send to your friends. iPhone 6 users will notice that it’s sorely in need of an update for the larger screen (and it could stand to add a few apps beyond Apple’s staples), but if you have a lot of people to message each day, Contact Center is as good as a personal assistant. 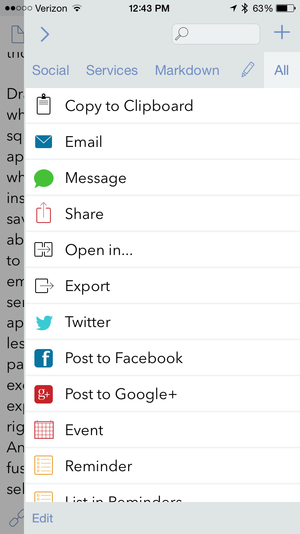 Drafts’ sharing menu puts all other text editors to shame. There are myriad ways to take notes on our iPhones, but getting our words out of the app they’re inside isn’t always so easy. Drafts ($10) understands this problem. More of an idea organizer than a text editor, the app doesn’t just capture what you’re thinking—it gives you complete control over how, where, and when your thoughts are used. Drafts looks like any old iOS note taker when you start composing, but the sharing icon in the top-right corner sets it apart from its competitors. Tap it and you’ll find far more than the usual pop-up sheet—a whole universe of actions become instantly available to you, letting you save, share, and ship your words just about anywhere. 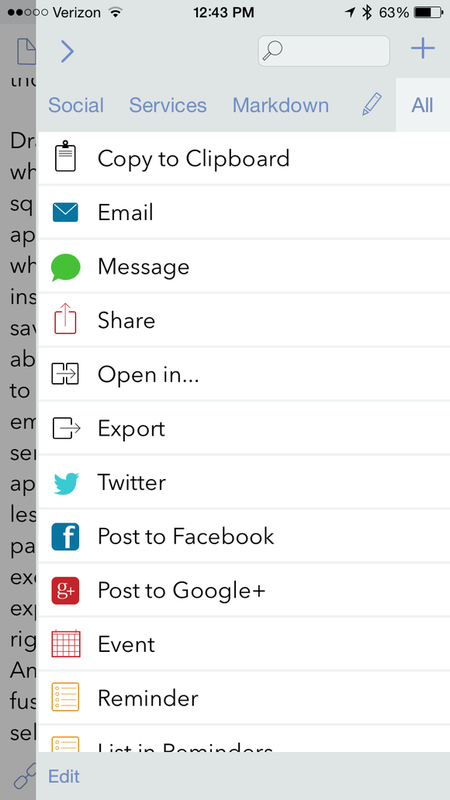 Whether you’re posting to Facebook or your blog, sending an email or message, sharing with a cloud service, or simply exporting to another app, Drafts will dutifully expedite it. In less time than it takes to undangle a participle, you’ll be able to find and execute the action you need from its expansive library—or if you can’t find the right one, you can always make your own. And the best part is you won’t have to fuss with those confounding text selection handles ever again. Being able to launch apps and actions just by swiping down from the top of the screen might be the best use of the Notification Center widget system, so it’s a bit surprising that Launch Center Pro doesn’t have one yet. But there are a couple of excellent options out there. Thankfully Apple decided to reverse course on its decision to ban launchers from the Notification Center. Launcher (free; $5 in-app purchase for Pro version) made a name for itself after it was tossed from the App Store over a “misuse of widgets.” We’re still not completely sure what Apple’s exact problem with it was, but it was allowed back some six months later, and it’s just as great as it was back then. Divided into four categories—contacts, websites, apps, and custom—the app doesn’t reinvent the wheel, but it does add a nice layer of grease. The apps and actions you create within the app are mirrored in the Notification Center, letting you quickly launch them no matter how many home screens away they are. While Launcher will likely suffice for most shortcut seekers, the aptly named Launcher Widget (free) adds enough creative flourishes to elevate it above its seeming copycat status. My favorite is the ability to resize individual icons, turning mere shortcuts into super shortcuts and letting you quickly identify your most commonly used apps. There are other quick settings in the composition window that set the interface apart from Launcher’s, but both apps offer an extremely similar set of features, and whether you choose the original or its descendent, you won’t be disappointed. Additionally, music lovers should check out Music Launcher (free; $3 in-app purchase for Pro version), which puts your favorite songs and podcasts right in your Notification Center for easy playback. If you spend a lot of time navigating to your music app of choice, this will be a godsend. Just pick the songs or podcasts that you want to add and all you’ll need to do is pull down the Notification Center to access them. And you can even shuffle, skip and repeat tracks right in the widget. Alloy ($6) is an app that’s easy to overlook (as I write this, in fact, it doesn’t have enough ratings to generate a star average), but there’s a lot to like about it. The interface doesn’t quite have the sophistication of Launch Center Pro, but there’s a definite thoughtfulness to the experience. It’s sort of like a mash-up between the iPhone and Apple Watch, with a home screen-style grid and circular icons, and it’s as easy as it looks to organize your shortcuts and actions. A dynamic Favorites menu in the bottom-right corner keeps track of your recent and most-used tasks, which are mirrored in the handy Notification Center widget. The library of bundled actions is far smaller than Launch Center Pro’s, but something about Alloy kept it on my radar even as I tested other launcher apps—it’s not able to live up to the high LCP bar in its current incarnation, but with a little polish, a price cut, and some tweaks to the somewhat confusing action composer, it could be a great launcher one day. Have any favorite iOS app launchers or tips? Sound off in the comments below. Editor's note: This story was updated on June 18, 2015 at 2:30 p.m. Pacific to provide updated info and screenshots for the Drafts app.